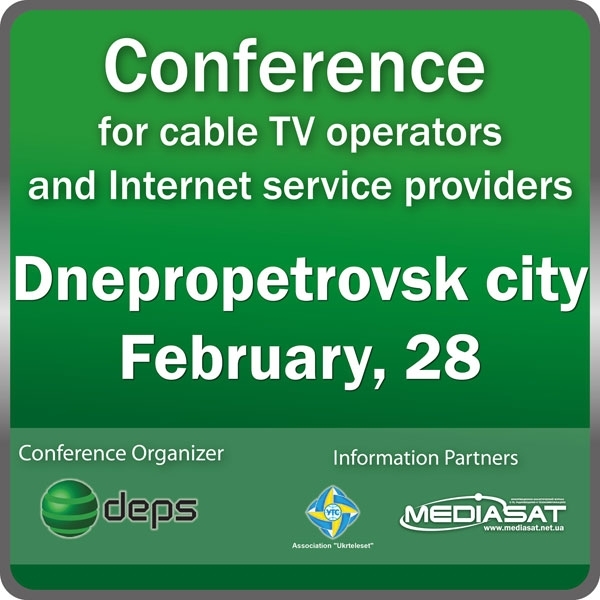 We invite you to attend consulting and practical conference for cable TV operators and Internet service providers, which will be held February, 28 in Dnepropetrovsk city at Ice Palace of Sports "Meteor" to the address: 27a, Makarova Str., Dnepropetrovsk city. Media Partner: Association "Ukrteleset"; journal "Mediasat". Topics of the conference will be focused on issues of networks building and its developing. Your participation in the conference will let you learn about the latest trends in the market of telecommunications equipment and will get you the most useful and relevant information. The conference will be accompanied by an equipment exhibition. After the registration, a confirmation email with an individual number will come to your specified e-mail box . You are to print and present it at the entrance to the conference room.